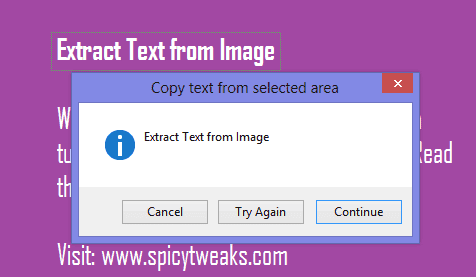 Have you ever felt into situation when you want to copy and extract text from an image and save it as a text file? Read this post to know how to do this. If you work a lot with images than you should have come into a situation where you want to extract or copy text from an image. You may find an image with some inspirational quotes which you would like to insert on your blog or save on your PC as a text file. Most people who don't know how to copy text from an image will write the quote by seeing the pic which can take lots of time. Instead of writing it yourself, you can use OCR (Optical Character Recognition) software. These type of software can help you in recognizing texts from an image. GT Text is one of the OCR software that you can use to accomplish this task. It is very handy and you'll not face any difficulty using it. This software work in all major versions of Windows including XP, Vista, 7 & 8. Now, follow the tutorial. To start extracting text, go to this link and download the latest version of GT Text. Note: At the time of writing this post I am using version 1.4.5 of the software on my Windows 8 PC. Install the software when the download get finished. You can now open the application. Run the application and Windows Explorer will appear while you open it. Browse the location of the image you want to extract & copy text. Select the image after finding it and click on open button. 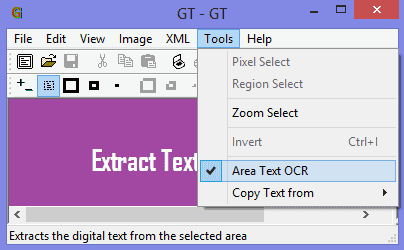 Now go to Tools and select Area Text OCR. It will help you to create rectangular region around the text on an image. Left click your mouse and create and rectangular area around the text. When you're sure you have covered all the text (to copy) inside the rectangular region, release the mouse. You'll see a dialog box appears after releasing the mouse. Check if the text inside the prompt is same as it is on the image and click Continue button to copy those texts to your Windows Clipboard. Tip: If the text in the prompt doesn't matches the actual text than click on Try again button. If you don't want to copy text, click Cancel. You ca also Store Multiple Items to your Windows Clipboard. After clicking continue, open Notepad (or any other text editor like MS Office) and press CTRL + V to paste the copied text. Go to Tools > Copy Text from > Full Image. If the text language on the image isn't in English than you can install any other language. To do this go to File > Preferences and click on Add language and install the language of your choice. You might not able to extract and copy texts from the image which is not very clear or if the font is too blurry or if the font style isn't recognizable.